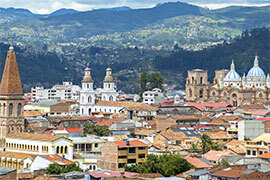 Cuenca, the capital of the Azuay province and third largest city in Ecuador, is the economic center of the southern Sierra. With its 8,000-foot elevation, cobblestone streets, cathedrals and colonial parks, Cuenca is perhaps the country’s most charming city. And, not coincidentally, Cuenca recently has enjoyed resurgence as a safe, low-cost and generally pleasant locale for expatriates to rediscover and for retirees to live. At Stetson, Cuenca also represents an opportunity for students to travel abroad, using this natural wonderland, believed to have been founded around 500 A.D., as their own classroom. The next lessons are scheduled for June 1-30, 2019, when up to 10 students will gain a “total immersion experience,” according to Bill Nylen, Ph.D., professor of political science, who will serve as faculty mentor. Among the planned sites to visit with the students are churches, parks and museums, along with indigenous communities and the picturesque countryside, where all four of southern Ecuador’s distinct cultures (Hispanic, Cañari, Saraguro and Cholo) will be on full display. For students, also included in the trip is a mandatory Spanish class plus optional instruction, with the study falling under a four-credit course. Each student will be hosted by a family. The cost, excluding airfare, is roughly $3,000 (including meals and room/board). The response from students who traveled to Cuenca last summer? Noah Katz, a senior history major, went on and on about his experience, which even entailed attending a church mass with his host family (all in Spanish) and a wedding — both “unofficial” adventures. He concluded that the trip “exceeded expectations” before exclaiming, “I had a wonderful time!” For good measure, Katz added that he remains in touch with his host family. On the upcoming trip, Nylen will replace Bob Sitler, Ph.D., Latin American and Latino Studies Program director and professor of world languages and cultures. One of the reasons is that Sitler is planning 12 days in Yucatan, Mexico, Dec. 28-Jan. 8, with four students. There, subjects will range from seven ancient ruins and eight natural landscapes to nine Mayan villages. In preparation, this fall the four students are taking a classroom course — mostly taught at Sitler’s home — then returning for a post-trip spring course that will encompass project and presentation work. “This is about seeing, feeling, smelling. And most students respond very well to that,” Sitler commented. Their study abroad is part of a concerted effort by faculty, as well as a curriculum requirement, through Stetson’s Latin American and Latino Studies, a multidisciplinary and experientially oriented program that encompasses social, cultural, political and economic systems of regions. Students, who receive a minor, must complete at least one experientially oriented credit-bearing course as part of their academic requirements. 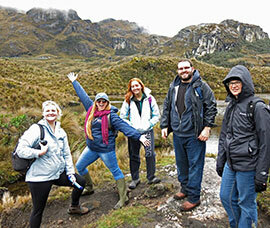 This may include a Mentored Field Experience, study abroad in Latin America and/or approved internships. In the past, students have studied in Guatemala, Peru, Mexico, Belize, Argentina, Brazil, Uruguay, Ecuador and Puerto Rico. And, with Spanish being the most studied language on campus, the program is especially popular across a campus that clearly is bullish on study abroad. In all, 24 study abroad trips, the most ever at Stetson, have been proposed for 2018-2019, according to Wendy Viggiano, program coordinator of International Learning. Notably, the Mentored Field Experience is a program sponsored by the Latin American and Latino Studies department that began in 1995, fully funded by alumnus Mark Hollis ’56, a university former trustee. The program covers the expenses of up to four students each summer on professor-led trips to South America, Central America, Mexico and the Caribbean. Before visiting a country, the students must spend the spring semester in the classroom, preparing for the trip by learning the history, politics and culture of the nation, as well as submitting a research proposal. During the trip, the students collect data for those projects, culminating with a fall-semester, post-travel evaluation course and presentation of their research at Stetson. Essentially, students travel the world and learn by doing, one real lesson at a time.